A spectacular night-time view of Earth, called Black Marble, has been assembled from a series of cloud-free images acquired by one of the most capable satellites in the sky today – the Suomi spacecraft. The platform was launched by the US last year, principally to deliver critical meteorological data. 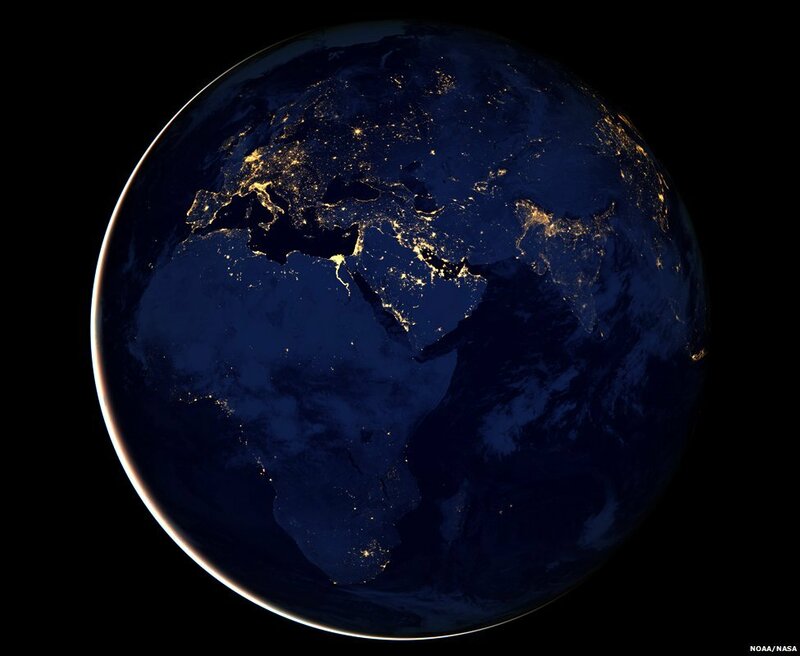 The Black Marble dataset shows off one of Suomi’s key innovations: the low-light sensitivity of its VIIRS instrument. VIIRS (Visible Infrared Imaging Radiometer Suite) can discern a range of phenomena of interest to weather forecasters – cloud, snow, fog, etc – even when the satellite is on the dark side of the Earth. Most of the time, all VIIRS needs to do its work is some illumination from the Moon. But if that is not available, the instrument can still detect features down below just from the nocturnal glow of the atmosphere itself. And, of course, just as this Black Marble rendition demonstrates, VIIRS is also very good at capturing the lights of our cities. The new imagery was unveiled here at the American Geophysical Union (AGU) Fall Meeting, the largest annual gathering of Earth scientists. Data from Suomi – a joint NASA and National Oceanic and Atmospheric Administration (NOAA) satellite – is certain to become a mainstay of future presentations at this conference. VIIRS’ trick is its special day-night band. Unlike a camera that captures a whole picture in one exposure, the day-night band produces an image by repeatedly scanning a scene and resolving it as millions of individual pixels. The system then reviews the amount of light in each pixel. If it is very bright, a low-gain mode prevents the pixel from oversaturating; if the pixel is very dark, the signal is amplified. US Air Force satellites have pushed the development of low-light sensors for decades but NASA/NOAA representatives at the AGU meeting said VIIRS had taken the capability to a new level. One of the instrument’s most important observations of late was to watch Hurricane Sandy as it made landfall over the US in October. Suomi was launched as the NPP (National Polar-orbiting Operational Environmental Satellite System Preparatory Project) satellite. It was subsequently renamed in honor of the pioneering Earth observation scientist Verner E. Suomi. The two-tonne, $1.5 billion spacecraft circles the globe, pole to pole, at an altitude just over 800 km. Its five instruments are tasked with monitoring a huge range of land, ocean, and atmospheric phenomena – from the temperature and humidity of the air, to the spread of algal blooms in the ocean; and from the amount of sunlight bouncing off clouds to the extent of Arctic ice. iPhone 5S pictures leaked online?